After the fall of Charleston SC in May 1780, the British army worked to win support for King George III and put an end to any uprisings from the Patriots. In July, American General Horatio Gates moved his army of 5000 troops into South Carolina to push General Charles Lord Cornwallis out of this Southern colony. Unfortunately, because of false information and sick men, on August 16, Gates was defeated at Camden. And then General Thomas Sumter lost to the British at Fishing Creek. At twilight on August 18, 1780, 200 mounted militiamen left their Broad River camp near the North Carolina border and headed south. 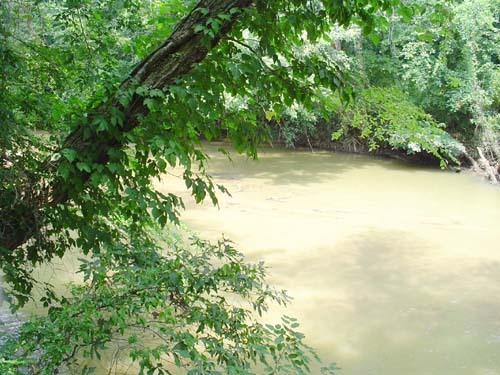 Their attack goal was a Tory encampment at Musgrove’s Mill on the south side of the Enoree River. The commanders were Colonels Issac Shelby, Elijah Clark, and James Williams. Traveling through the darkness, they covered approximately forty miles to reach to arrive above the river for their surprise attack. It was a long, arduous, and tense night, as they galloped across rivers and streams. At sunrise, the march ended about half mile from Musgrove’s Mill. An enemy patrol then stumbled upon them. But they arrived in the area only to receive some other unwelcome news. The Loyalists had been reinforced. Instead of attacking a camp of 200 men, the Patriots would be attacking a camp of 500. The Patriot commanders struggled to make a decision. Their horses had been ridden hard all night and were too tired to continue. The scouts also told them of the additional 300 British troops, who had arrived the day before. How to still have an advantage over a larger force was a necessity, so a final plan was made to drive the enemy out. These Patriot militia had learned guerilla warfare from fighting the Cherokee. Using those tactics, a band of about twenty men under Captain Shadrach Inman crossed the Enoree and engaged the enemy. The small group, faking confusion, retreated, luring the Loyalists with them until all were nearly on the Patriot line. Waiting, like a cat does for a mouse, the some partisans took up a stand across the road and took the high ground. The surprised Loyalists fired too early. The Patriots held their fire until the Loyalists got within killing range of their muskets. Cracks of musket fire and shouts destroyed the silence of the river. Men dressed in homespun and others in scarlet red soon lay side-by-side. Years after the battle, Colonel Shelby wrote that “the smoke” from the battle of Musgrove’s Mill was so thick as to hide a man at the distance of twenty yards. The whole battle took less than an hour. As the Patriots shrieked Indian war cries, sixty- three Tories were killed, and seventy were taken prisoner. The Patriots lost only four men, including Captain Inman. The untrained militia defeated the seasoned Tory troops in a hit-and-run attack. Small successes, like this one, gave confidence to the partisans. Neither having to monitor and adjust their battle plan or the extreme Carolina heat kept the Patriots from winning their prize. Huzzah! A formal Revolutionary War Battle Commemoration Ceremony will take place at the Visitor Center location at 10 a.m. on Saturday, Aug. 18, 2018. It will be a celebration to enjoy and another opportunity to celebrate our freedom. Posted in Uncategorized and tagged Elijah Clark, Issac Shelby, James Williams, Musgrove's Mill. Bookmark the permalink.